Two hotel security guards are dead after a gunman shot them in one of the hotel’s rooms on Saturday, Dec. 30, then fled the scene. He later reportedly shot himself. A little before 6:35 a.m., security was called to a room in Arizona Charlie’s Decatur, at 740 S. Decatur Blvd. 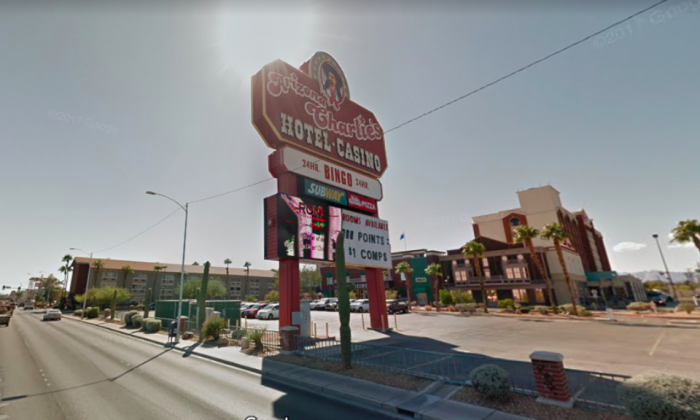 where a woman said two men had forced her out of her room after she had invited them in, the Las Vegas Metropolitan Police said. When two security guards, a man and a woman in their forties, arrived at the room, only one of the men was still there. The suspect, 29-year-old Christopher Olague, briefly argued with the guards before opening fire and killing them, homicide detective Lt. Dan McGrath said, according to the Las Vegas Review-Journal. Only the female security guard was armed, he said, and she did not draw her weapon. The gunman then ran to a neighborhood west of the hotel where he attempted and failed to steal two cars. He jumped over the backyard wall of a home and tried to break in through the back door, but the homeowner kept him from entering, police said. “Officers were already on scene, and as they’re closing in on him, he enters the garage, which had a laundry room, and shoots himself in the head,” McGrath said, according to the Review-Journal. Olague was taken to the hospital and as of Saturday evening was still alive, but McGrath said he isn’t expected to survive. Police have not been able to get in contact with either the woman who made the call to security that morning or the other man who allegedly forced her out of her room. The identity of the two security guards has not yet been released pending notification of their next of kin. McGrath said Olague would have faced “a number of felony charges,” the Review-Journal reports, including murder, attempted murder, burglary, and attempted robbery. Olague’s motive wasn’t known, but investigators believe it was an isolated incident. “I want you to know right now that this has nothing to do with terrorism,” Capt. Robert Plummer of the Las Vegas Metropolitan Police Department, said, according to Fox News.